If you have never taken a deeper look at WordPress project schedules you could be surprised by the fact that as soon as one major version is officially released, WordPress development team shifts its focus to next one – WordPress 3.5. A look back shows that major WordPress versions are being released roughly every six months; keeping that tradition alive, WordPress core development team has set December 5th as target date for WordPress 3.5 launch. Let’s take a quick look at some of its key features. Twenty Twelve, default theme in WordPress 3.5 comes with a feature set that’s as predictable as its name, and that’s a good thing. Completely in line with WordPress’ philosophy of striving for simplicity and keeping things “clean, lean and mean”, Twenty Twelve is meant to be as unobtrusive as possible, letting your content be the star. This is the first default theme with homepage template and clearly using this feature to advertise WordPress as more of a CMS and less of a “just a blog” was one of the goals. Everyone’s favourite buzz word (hint: begins with a “responsi”) is another thing theme designer Drew Strojny had in mind. Not sure how many people actually used this feature, but it sure did help popularise the word “Blogroll”. With the addition of WordPress menus in version 3.0, however, links manager became obsolete, so core team decided to move this feature out of WordPress core and into a plugin, similar to how import feature works now. This might seem like it’s unimportant, after all it’s just one unused feature being removed from WordPress core, but if it is a sign of things to come, WordPress’ off the charts usability might be even better in the future. I’ll be honest here, if this was only about making things look good/better on retina iOS devices, I wouldn’t care about it. 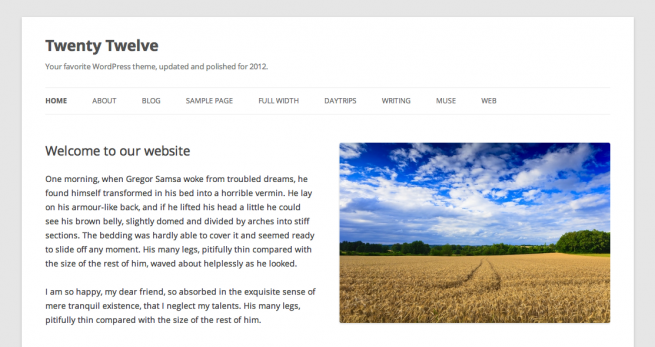 However, retina support in WordPress 3.5 also means converting many design elements to CSS3 shapes and gradients. Less images to load equals better performance, whether you’re using a new iPad or an old IE. Simple as that. This list is not final, but if you’re a WordPress user it should be enough to get you excited. If you’d like to check out WordPress 3.5 before most other folks do, you can run it right now, by using WordPress Beta Tester plugin. Keep in mind that you will be running a potentially unstable release, so either backup your database before upgrading or do not do this on a live site. Everything we develop here at ThematoSoup is intented to be as future proof as possible. We try to achieve compatibility with future WordPress releases by always following WordPress best practices and coding standards, so you don’t have to ponder if keeping your WordPress installation up to date will break something. from Matt Wiebe. I’m a colour geek, so this is a great little addition for me! But I agree, it looks really good. New image editor, too.